When lunchtime came around, my indoctrination into the family was completed after my efforts to buy an ice cream were refused. Instead, one of the men purchased one for me. I also had several pictures with the family. “You are like our son today – we take care of you well,” one of the men announced with a grin. I agreed wholeheartedly and thanked them all very much. “Now is 11:30 am, my family will go to a temple to pray for ancestors,” the father told me. I was a bit sad, for I wanted to spend more time with them. I showed my appreciation by saying how lucky I was to have met them, and promising that if they ever came to Australia, I would cook them some Italian food. Then we said our goodbyes. I decided to venture off to the Ho Chi Minh Museum. But I had forgotten about the lunchtime closure – government-run buildings in Vietnam shut at midday and re-open two hours later. As I walked down the stairs of the museum to head back to the main park, I considered heading back to the hostel, as I had no idea what else to do. Then I heard a child scream out “Hello!” I looked around and found myself being stared at by nearly 100 elementary school children wearing red and white school uniform, presumably having just finished an excursion of the Ho Chi Minh Museum. Without scanning the sea of faces to remember which child had called out to me, I responded by shouting, “HELLO, CHILDREN OF HANOI!” It had the effect of a snowflake setting off a snowball down a mountain. The mere mention of the words ‘hello’ and ‘Hanoi’ had boys and girls yelling out “HELLO!”, “HOW ARE YOU?”, “WHAT’S YOUR NAME?” and any other sentence I could not decipher. For a brief time, I imagined myself lapping up hysterical screams reminiscent to Beatlemania, or at least The Wiggles. Greeting the teachers first, I went up to the first boy in line, shook his hand, and asked how he was doing. He smiled, exposing gaps where his baby teeth had once been. The boys were more eager to ask questions, although a few girls broke with protocol by exchanging greetings and shaking hands with me. 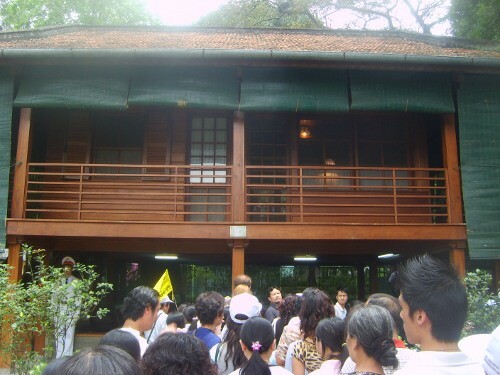 When I turned behind me and looked at the teachers talking amongst themselves, I realized that it was time for me to get out before I faced the possibility of the headline, “I am bigger than Ho Chi Minh – Foreigner”, accompanied by a picture of me being led away by officials in disgrace. Solitude is what I sought, and the quiet open spaces surrounding the museum became a sanctuary. The solitude lasted for about 30 seconds when I found myself approached by a young woman saying that she was a student learning English. For the first time in my life, I wished somebody would ask me if I came here often. She struck up a conversation with me, wanting to know my birthplace, thoughts on Vietnam and where I was staying in Hanoi. When I started to answer some questions, she said, “Let’s go for a walk and have some coffee and conversation”, I sensed a scam, for she spoke a little too eloquently to be just a learner. My nerves were not eased when she was joined by two more girls. I reassured myself that nobody would be that cruel to commit any crimes on dedicated to Ho Chi Minh. Perhaps I could have been the first foreigner these university students had direct contact with. I did not want it to be their last. “We would like to be your tour guide in the Ho Chi Minh Museum today,” one of the students asked me. “We need practice for our course,” added another girl. We walked around the museum, but rather than talking about everything in there, I got to know my hosts better. We spoke about their cultural norms in our respective countries, career aspirations, and what we all expected from life. The girls were a little surprised that happiness, not material goods, was more important for me. I explained that practicing Buddhism in Southeast Asia had helped me, following a year of teaching English in South Korea. Maybe they were fascinated as to where I had been, not what I had done. They asked me questions like, “Do you like this car? Who’s your favorite actor? What do you think of Vietnamese women?” These girls idolized celebrities like George Clooney and Jackie Chan and loved pop music, not political philosophers. They represented the ‘new’ Vietnam, one where their boundaries were not limited to life in a town or village, but rather constant interaction with international visitors in Hanoi or Saigon, and maybe even a stint abroad. “We love Hanoi but we want to see more of the world,” one of the guides said to me in the afternoon. Their knowledge of the Vietnam War was predominately based on school books and stories their parents and grandparents had told them, but they were not relayed with a great deal of passion. When I asked why they had not learned more, I got the response “not our time,” a reference to not growing up surrounded by airplanes dropping bombs or being rushed into tunnels. “What about Ho Chi Minh? What do you think of him?” I asked. “Yes, he is. Vietnamese everywhere love him,” was a response from one girl. The other two looked on and nodded in agreement. When I asked them what they would do if somebody said something bad about Vietnam, the answer was unanimous; “We smile at them, but laugh when they are gone. We will meet more good people in the world.” This sentence has stayed with me ever since. “We have a website, please visit it and leave a message for us,” one of the girls said excitedly. I asked for the address, handed over a pen and piece of paper and then said I would make good on my promise. Unfortunately, I was never able to gain access to the website. “If all tour guides in Hanoi are as smart and are great company like you three have been today, then you will get many visitors,” I said reassuringly. The girls blushed and thanked me. “If we see you again, we can show you more places, like the Temple of Literature,” one of them added. “Yes, that would be nice. I would really like that,” I added. It should come as little surprise that I remember more about my guides and temporary adopted family as opposed to the fixtures relating to Vietnam’s modern father. Images of Ho Chi Minh will still be there in 50 years’ time, as will his embalmed body, but you only get one opportunity to meet with locals that you will appreciate forever. Be honored to learn about Vietnam’s past, embrace the local people you meet, and encourage them to achieve their future goals as if they were your own. That will provide the greatest present of all.